During freshman year of college, I lived off of Kraft mac ‘n cheese and Cocoa Puffs. Not because I couldn’t cook-but because Mother never let us have awful artificially flavored junk food in our household since it would “OH MY GOD, ROT OUR TEETH.” Never mind that our home had chipped lead paint, asbestos in the attic and that I’d wrestle with Brother on the lawn 10 seconds after Dad sprayed DDT. I gorged on Kraft mac ‘n cheese until I noticed my skin turning the shade of cheese-powder-orange-yellow. Whoah! That color whipped my heart back 28 years to North Platte, Neb., second grade, where I was the only Asian kid in the entire school. This was before “cultural sensitivity” became all the rage. We didn’t have a lot of money back then; while the other kids scored the 64 pack of Crayola with built-in sharpener, I got only 24. Well, 12 really, but I broke each one in half. I remember having trouble coloring the skin of my family, as Peach just wasn’t right, and Indian Red made me look like I’d swallowed a bottle of Taco Bell hot sauce. 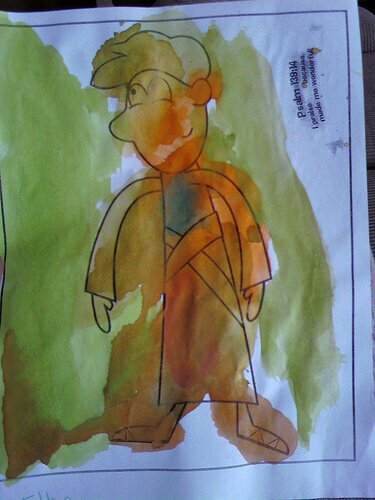 The darker kids in school already had dibs on Raw Sienna, so I had to adapt the technique of lightly rubbing a fat Yellow on its side, which made me look rather jaundiced. As a joke, one of the snickering Peach kids tossed his Ultra Orange at me, but I refused to let him see my embarrassment and pretended to be delighted at his generosity. So for the rest of the school year, everyone in my family was colored in Ultra Orange, which brings us back to why I ditched mac ‘n cheese. If you think about it, mac ‘n cheese really isn’t that convenient. It takes nine minutes to boil water (11 if you watch), 14 to cook the mac and two to reconstitute the “cheese”. Twenty-five minutes for 580 grams of sodium and 49 grams of carbs? I can give you a better fast food. My 15-Minute Asian Noodles are actually healthy and come with real vegetables. Take a trip to your local Asian market to stock up. Oyster sauce, Maggi sauce and Chinese rice wine are all inexpensive pantry items. The yellow noodles are “fresh” so they only take a couple of minutes to cook. Be creative with your vegetables. 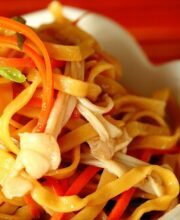 Red bell peppers, carrots, cabbage, scallions, onions, celery, mushrooms, bean sprouts or snow peas are all wonderful in this dish. The only rule is to cut the vegetables as thin as possible to make for a fast stir-fry. This dish is also a great way to use up last night’s leftover chicken slices, seafood, etc. Dammit! Ultra Orange will haunt me forever. 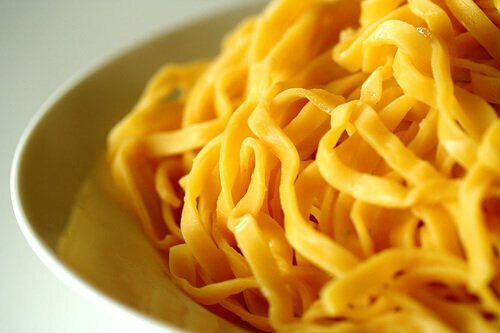 Here are the “fresh” egg noodles – boiled for less than 2 minutes! Just like fresh homemade pasta – you don’t really need to cook more than a couple of minutes. These are found either in the refrigerated section or they are frozen in the freezer (duh!) They both are great! I like keeping a couple of packs in my freezer for emergency noodle snacking or for a lazy dinner. 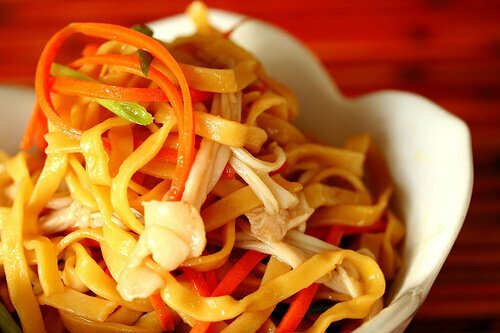 They can be thick with a nice bite like photo below, or really thin and labelled “won ton” noodles. Just make sure you read the package directions for cooking times. 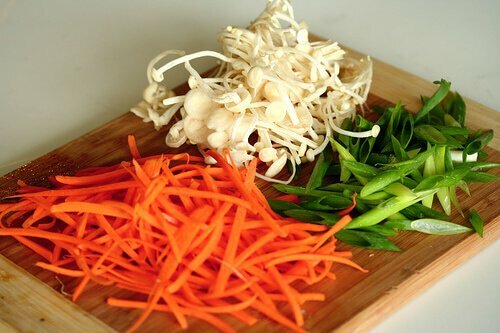 Selection of veg that I used – enoki mushrooms, scallions and julienned carrots. Those perfectly julienned carrots took less than 1 minute to cut – with one of these nifty gadgets – Oxo Julienne Peeler – I also saw it at Target this past weekend. LOVE IT. Take a large thick carrot, peel it with your normal peeler. Stick a fork on one end to anchor the carrot down flat on the cutting board. Use the julienne peeler to cut strips lengthwise down. Your veg should be cut into thin strips – cuts the cooking time down! My arsenal of sauces: oyster sauce, Chinese rice wine and my beloved Maggi sauce – which makes EVERYTHING taste better. If you don’t have Maggi – get some! I know I’m not the only one who has a serious Maggi addiction. And if you must know, Epicurious even has 6 recipes using Maggi sauce. You can add last night’s leftover chicken slices or just go vegetarian like I did below. If I’m extra extra lazy, I get a cooked rotisserie chicken from the market and shred the meat to serve. 1. Boil 6 cups of water and cook noodles according to package directions (timing depends on thickness of noodles). Use your chopsticks to jiggle and separate the noodle strands in the water. Reserve 1/4 cup of hot noodle water. Drain noodles, set aside. While water is boiling, thinly slice your vegetables. Multitask! 2. Heat wok or large fry pan over high heat. When hot, add cooking oil. Add scallions, fry for 10 seconds. Add carrots, fry until softened, 30 seconds. Add mushrooms, fry 30 seconds. Which Blogger Dish to Cook on TV? Don’t forget to vote! I’m cooking live on our local ABC station next Tuesday – and have decided to feature of our fellow blogger dishes. Vote for your favorite dish! I think it’s a great way to promote the world of food blogs. I’ve gotten over 530 votes so far, but the race is close between The Delicious Life‘s Bulgogi Burgers and Rasa Malaysia’s Coconut Butter Prawns! Vote here. Ash – You can use Bragg’s Liquid Aminos. Same taste – No MSG! just made this am. very good. added little sugar. Soy sauce does have gluten as well…though there is now gluten-free soy sauce available. I was making pad Thai and did not have tamarind so I was looking for seasoning alternatives when I found this recipe… I had not heard of Maggi sauce so I did a little research. Maggi sauce is vegetarian, but its primary ingredients are wheat gluten and MSG. I just thought you might want to alert readers who suffer from wheat allergy, Celiac or frequent migraines. Maggi sauce is a seasoning that those folks would want to avoid. Not a problem in preparing the recipe – since you give a soy sauce substitution. Thanks. Yes! Publix has it. Just bought a bottle the other day. OMG..maggi is one of my favorite sauces. my bf prefers kikkoman. First of all, Jaden… I became a fan of your blog, after goggling the potstickers recipe randomly and surprisingly found your blog! Love your noodles recipe, who does not like noodles anyway? If Maggi is one of your favourite seasonings, my secret weapon is ‘Kecap Manis’. I add this to my fried noodles (mee goreng), Indonesian fried rice (nasi goreng) and fried flat rice noodles (char kwey teow), and chicken wings, and chicken satay! I’m licking the bottom of the bowl over here… and I do believe it took even fewer than 15– and saved me from takeout. I just made these (15-minute Asian Noodles.) I overcooked the noodles as the instructions were in Korean I beleive, anyway other than that they turned out very well. Tasty. BUT, what do I do with this quart bottle of Maggi sauce I now have? Help! This may sound silly but how do you deal with the enoki mushroom? Wash it, cut off the roots and cook? If I do not have oyster sauce, can I use more soya sauce? or is oyster sauce essential to bring out the flavour of the dish? For the Chinese rice wine , can I use Hua Tiao Chiew? Looks delicious. Julienne slicer? Sweet! I’ve got to go to Target today and score one of those. Yep, I love doing this too. Especially during the week when I don’t have the time to cook, a cooked rotisserie chicken is the best way to make a good fast meal. I just love egg noodles! This looks like it’ll hit the spot! Love Asian-style noodles 🙂 Just bought a pack of home made siomai from the market and I’m sure this’ll be the perfect dish to match! Love it love it love it! I made this tonight and it was fabu! We’ll be repeating this over and over. I didn’t have Chinese noodles, so I used Soba noodles instead, and the starch gave for a nice sauce. Hah… I bet “Kat” above is from Tigers and Strawberries! That made a great meal tonight! I used the supermarket-style egg noodles (yes, like tuna noodle casserole) but I undercooked them a bit, so that I could finish them in the stir fry. 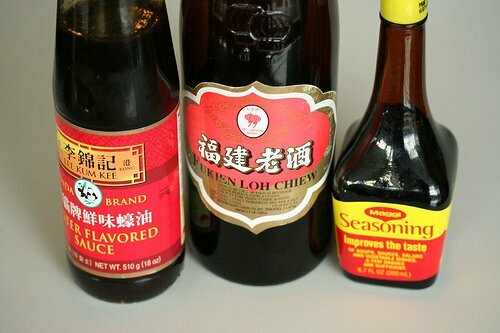 DON’T FEAR MSG… Chinese soy sauce, Maggi sauce, and fish sauce bring so much great umami flavor to the party which is absent from the endless bottles of Kikkoman everyone has in their refrigerator. OMG! Now your bright yellow and orange color dish will always haunt me now….lol…well done love your dish! 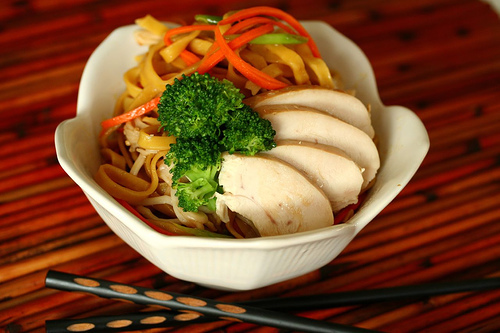 I love Asian noodles – any kind! Well, there is something seductive about mac & cheese, but really, what could look better than these noodles?! I am a total noodle-holic, so you know I’ll be trying this recipe. Awesome recipe! This is way better than mac and cheese. And who wants to eat that powdered stuff anyways? It just occurred to me that I should make some fresh noodles and keep them in the freezer since I bought a brand new pasta machine. *whee shiny new toy* A lot of the dried stuff I see in my Asian market is imitation egg noodle, bleh. 🙁 This noodle dish is one of my favorites for a quick meal. Suganya- Fish sauce and Oyster sauce are made from seafood, so no they are not vegetarian. But I think Maggi sauce is. I’ll have to ck when I get home. Worcestershire sauce actually is with anchovies, did you know? Maggi is much more “asian” tasting of course than Worcestershire sauce. May sound dumb. Are fish sauce and oyster sauce vegetarian? I know duck sauce is. And thanks for the info on maggi sauce. Will go get it :D. How would you compare the use of Worcestershire sauce here? Your 15 min. noodles look so good. That is so funny about the crayola crayons. I’m sure each childhood has a crayola story to tell. My own is… colouring with my older sister who decided to have a y crayon fight by marking me all over. Well, that’s not the whole truth. I marked her back too. My Mom came in and found us covered in crayon marks and crying /screaming at each other. She made us go scrub each mark off, and I can tell you it doesn’t come off easy. We were scrubbing for hours till our skin was raw. My Mom always knew how to punish us. We never did that again. You and 15 minute Asian Noodles….poetry! ;o) Hahaha…. Oh and I go with the burgers – those look awesome! If you can’t get people to eat healthy, I don’t know who can! This looks tasty and an awesome way for me to make dinner at 8:30pm because, let’s face it, sometimes I like to do healthy things and work out. But this saves me (and many others) from crappy take-out and worse yet, just vegetable-less entrees. 🙂 Btw, your julienned tool is on my wish list – there’s no Target nearby, but I’m going to find it, no matter what. Yum! I used to do something like this with ramen, using my own spices, back when that was the only kind of quick noodle I could find in Tennessee and South Dakota (shades *ahem* of North Platte). Thank goodness for a changing culture that lets Asian markets thrive!